Summer holidays in September give one the opportunity to visit places that are just outside of the range of a normal weekend. Elora is one of those places and so off we went. 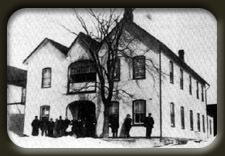 The town of Elora was founded as Irvine Settlement in 1832 but changed the name to Elora when the first post office was established in 1839. 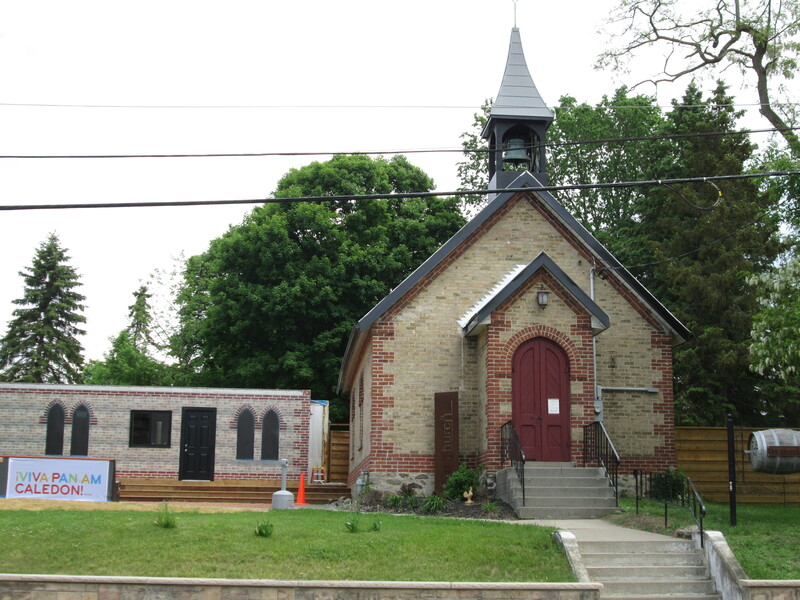 Like Saint Mary’s, Elora is a town of stone buildings, much of the materials were extracted from the Elora Quarry. 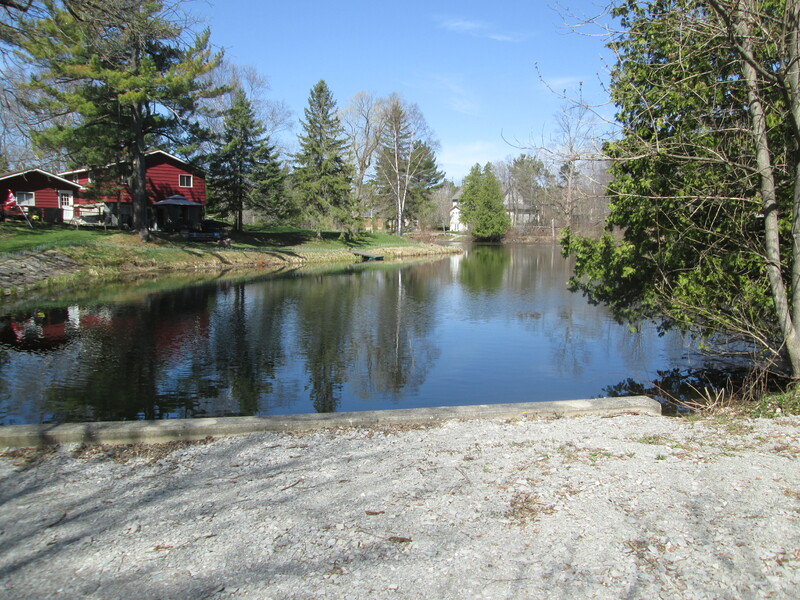 The Quarry is now a swimming area managed by the Elora Gorge Park and one fee allows access to both parks. 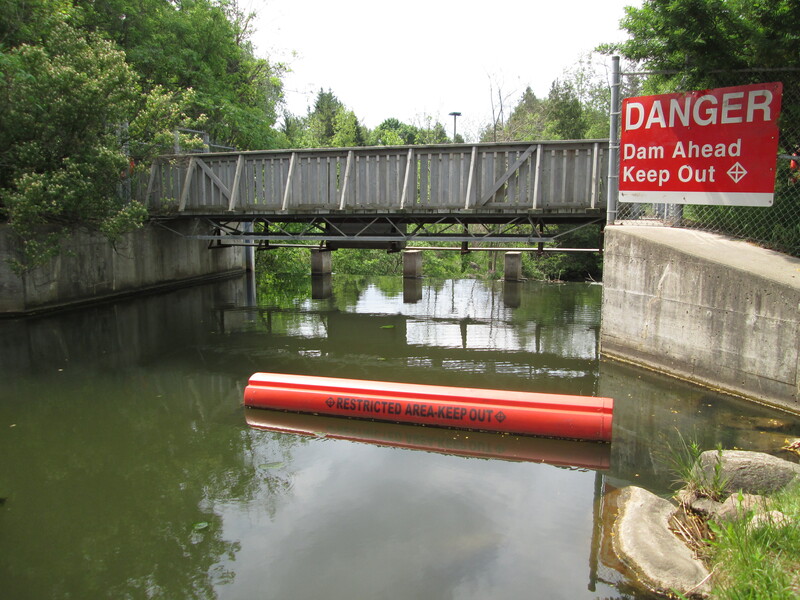 Unfortunately, at this time of year the swimming area is closed and the quarry property is marked as No Trespassing. After being unable to visit the quarry we parked in the large town lot behind Ross Street. 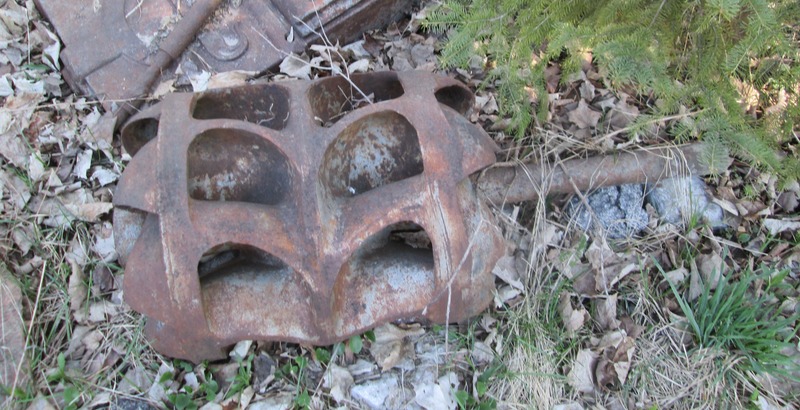 The local foundry business was established in 1848 and rented out to several entrepreneurs who repaired anything mechanical or made of metal for the community. The operation is most famously known as The Potter & Matheison Foundry. Later, nuts and bolts as well as saws and other implements were made here. This building is a fine example of restoration and we look forward to seeing what is done with the building next door. 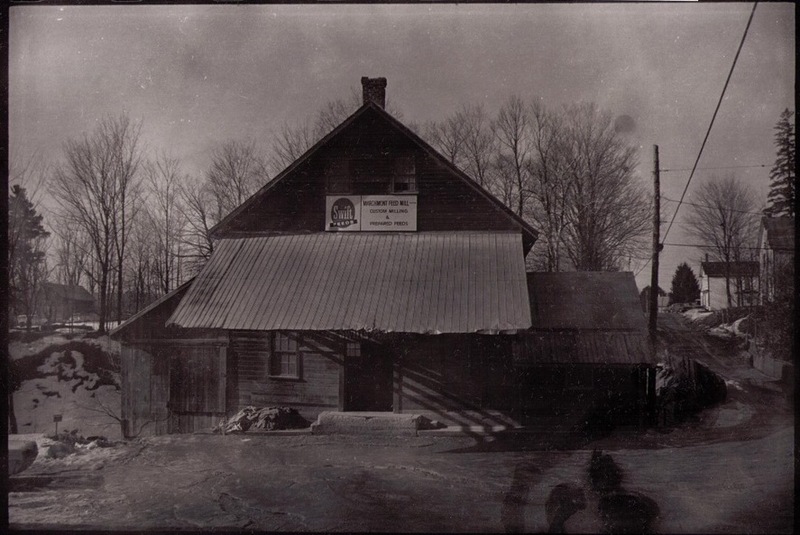 The building that is locally known as The Kiddie Kar Factory was built in 1873 following a fire at the site. 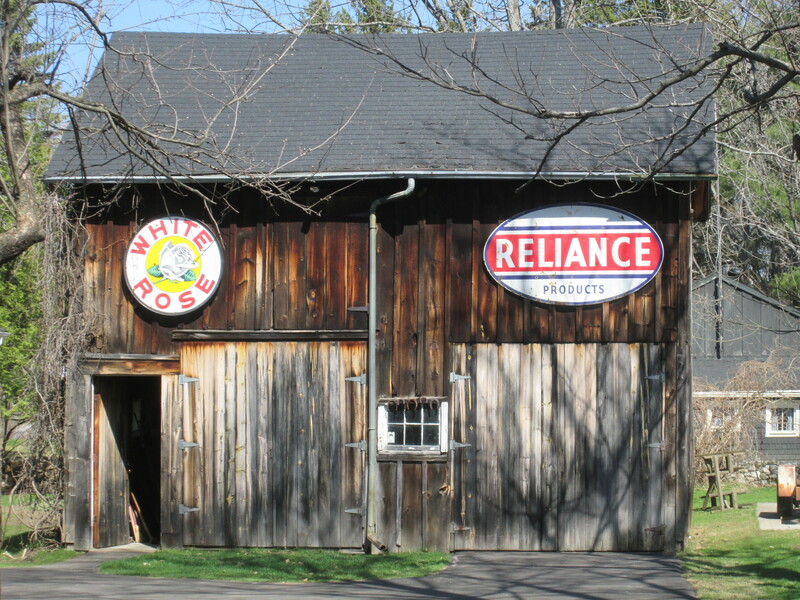 At the time it was known as The Elora Foundry and Agricultural Works. In 1916 John Mundell purchased the rights to the Kiddie Kar which was a wooden tricycle. He bought the old Potter foundry to use as a production factory. The plan for redevelopment of the south side of the river calls for the development of condominiums and a hotel. The old Kiddie Kar Factory is scheduled to be restored and included in the lobby of the condominium. Captain William Gilkinson, who founded the town, made plans for a sawmill as soon as he had purchased his property. Three years later it was destroyed by a fire but it was rebuilt in 1839. In 1854 the structure was rebuilt in stone but was destroyed by fire and rebuilt in 1859, 1866 and 1870. The mill operated under many owners for the next 100 years but by 1974 it was ready to be converted into a 5-star hotel. This was closed in 2010 but a new hotel development in 2018 has brought life back into the building. 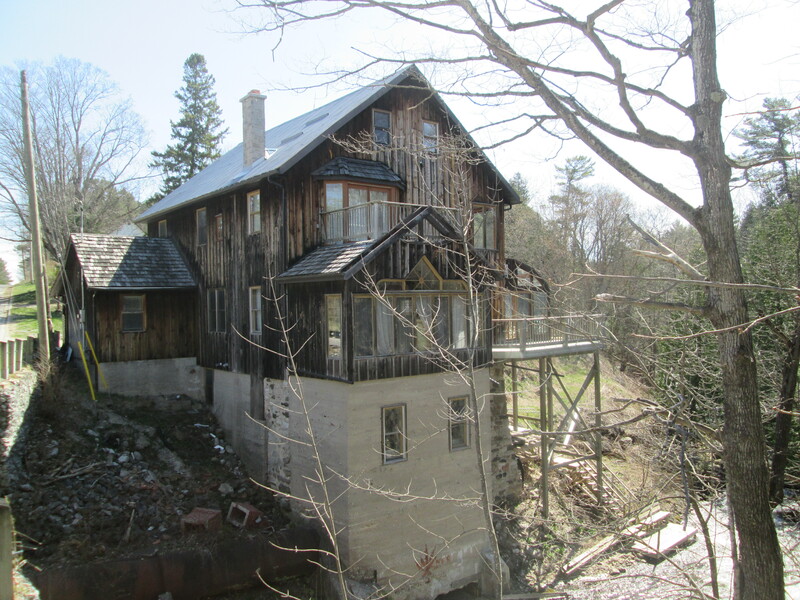 It is one of the few remaining 5-story mills in Ontario. 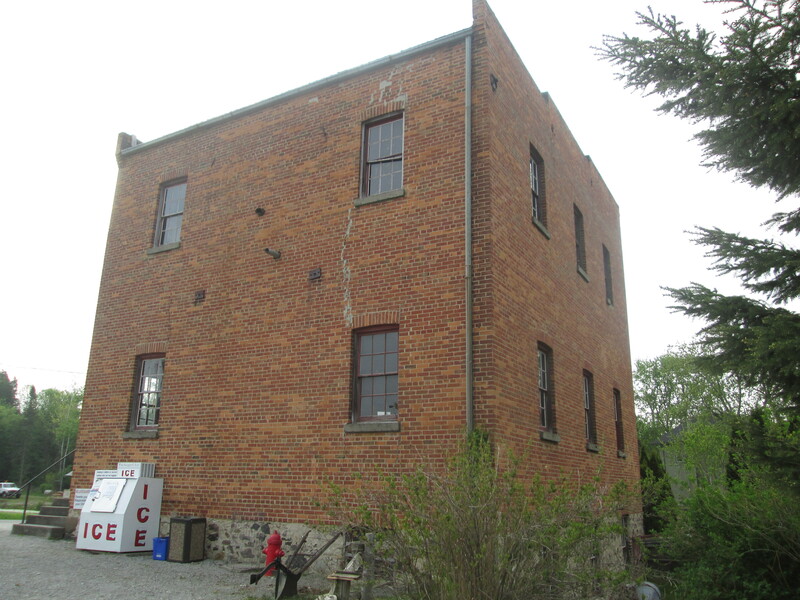 All that remains of The Elora Furniture Company is the shell of the building they developed in 1910. The site dates back to the 1850’s and had several uses and several fires as well including those of 1886 and 1896. By the 1920’s the factory was turning out bedsteads and wooden furniture frames with a staff of over 40 people. Much of their production was shipped unfinished to upholstery shops who completed them to the specification of the customers. A trail leads from behind the old industrial section of Elora and into the Elora Gorge Park from the back entrance. Three kilometres of trails wind through the park offering spectacular views of the gorge. Limestone cliffs rise 22-metres from the river to the table lands above. A stairway allows you to pass through a karst cave where you can reach a platform halfway down the side of the cliff face. This cave is known as the hole in the wall. A second cave is seen on the left in the picture below but it can’t be accessed safely. From here you have to climb the stairs back to the top of the ravine to continue downstream. There were several species of mushrooms that we hadn’t seen so far this season. Birch Polypores are quite distinctive among these shelf fungi. The tree below shows them in several stages of development, from a small bud to a fully formed mushroom. The underside has a lip around the outer edge. This polypore has had several uses over the years including being used as a razor strope, an anesthetic and to keep fires burning. Following the trail leads to a bridge where you can cross the river at the height of the gorge. There is also a low level bridge which was closed leading to a temporary closure of most of the campsites on the north side of the river. This bridge gives a nice view up and down the river which will be interesting as the fall colours come on. 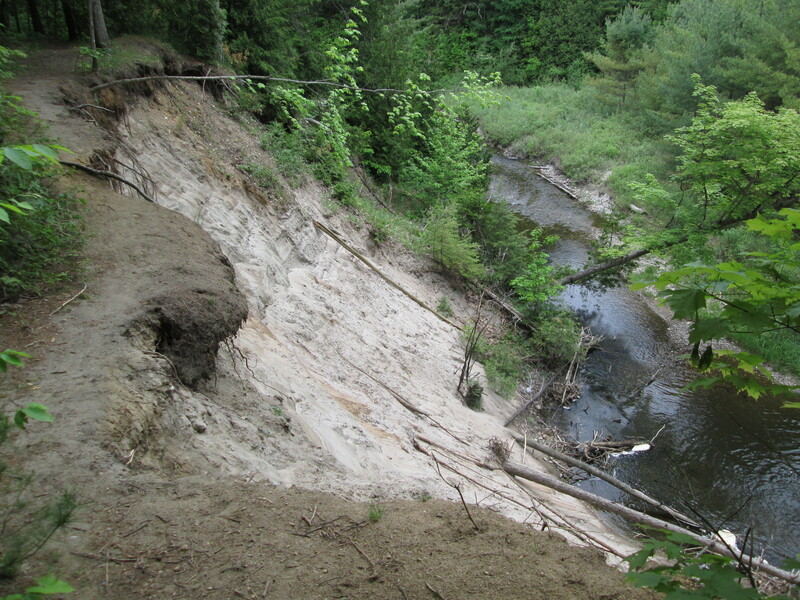 The park promotes tubbing down the Grand River through the ravine. There is a 2 kilometre course with specified entry and exit points. The stairs that access the river at the entry point have a crank at the top to hoist the stairs for the winter. This keeps the winter ice from demolishing them. There is room to follow the shore upstream a short distance when the water isn’t too high. This provides some nice views of the gorge from the lower perspective. People use the trails and stairs to access the river for fishing purposes. 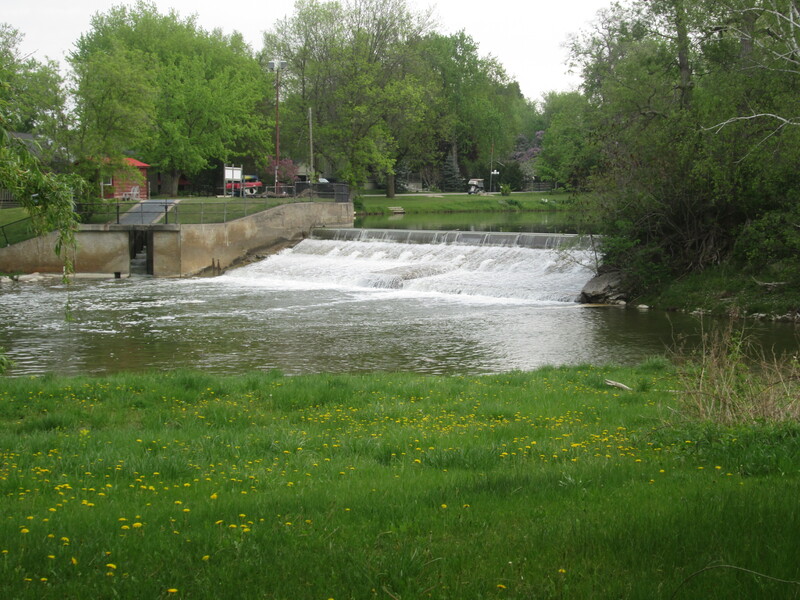 The area is known for brown trout but smallmouth bass, carp, northern pike and walleye are also caught. We followed the north side of the river until we found ourselves back in town. 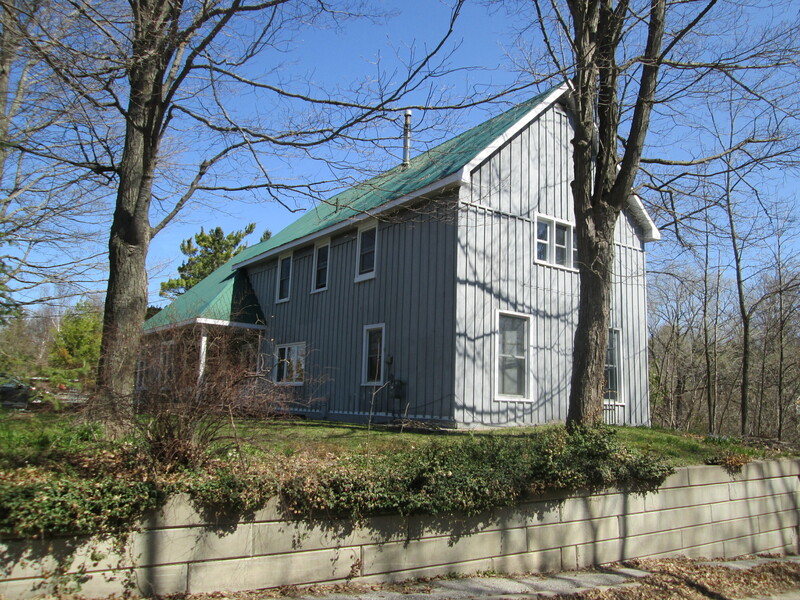 Elora has much of their early heritage preserved in the many stone buildings that remain in town. 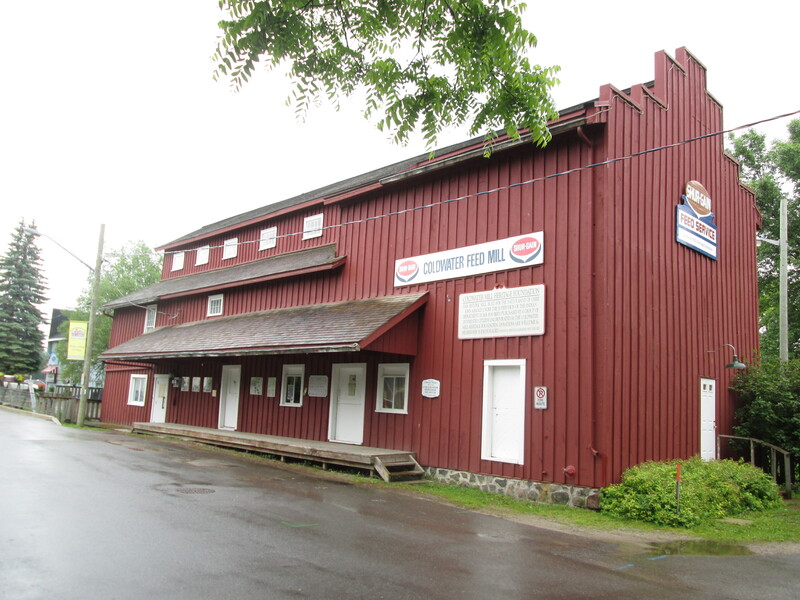 One building of interest is the drill shed which was built in 1865. During the 1860’s the United States was fighting their civil war and British North America started to fear for their defense and so the strength of local militias was increased. This led to the construction of drill sheds in which to train the volunteers. Most of these have been destroyed but this rare one still survives and today serves as a liquor store with an unusually beautiful interior. Just upstream from this building is a foot bridge and another dam. A nice old stone raceway leads from the pond behind the dam. Elora is a remarkably well preserved community that still displays much of the early architecture due to the fact that it was built of stone and didn’t fall prey to fire. While in the area, why not visit the Shand Dam? This entry was posted in Mills, Uncategorized and tagged Birch Polypore, Elora, Elora Gorge, Elora Mill, Hole In The Wall on October 6, 2018 by hikingthegta. It was a day after my father’s 80th birthday and so the plan was to meet in Barrie to celebrate. The choice between driving up the 400 or leaving earlier and making a side trip was less difficult than determining where that side trip would lead. In the end we chose to look at the Palgrave dam and mill pond. 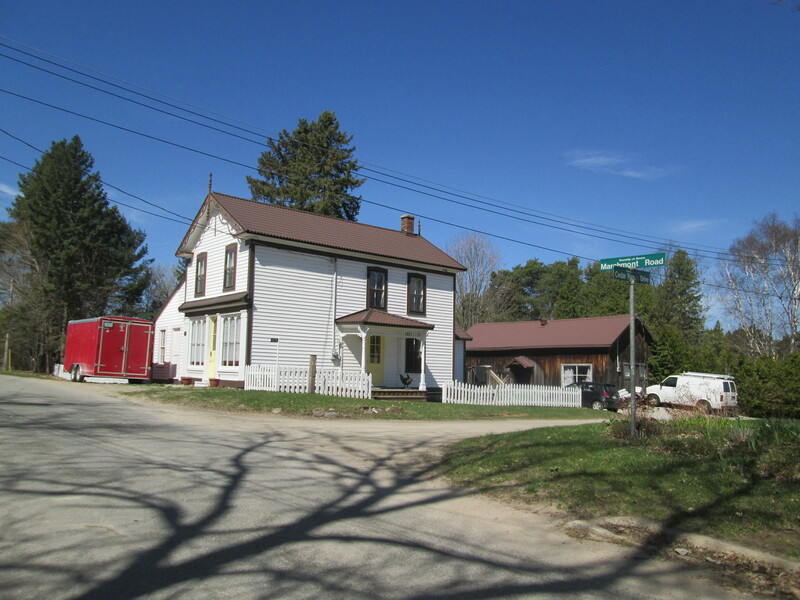 Palgrave was originally called Buckstown after the owner of the Western Hotel which was opened in 1846. This name survived until 1869 when the post office was established and the name was changed to Palgrave. Due to the large amount of lumber in the local forests this became an important industry in the early development of the town. It is the season for moth and butterflies to be in their larvae or caterpillar state. Inch worm is a term that is applied to the caterpillar of the geometer moth, a large family of 35,000 species. Ironically the word geometer applies better to the caterpillar than the moth as it comes from the Latin “geometra” or earth-measurer. This is because the caterpillar has only 2 or 3 prolegs on the back end. Their looping gait makes it look like they’re measuring the ground as they go along. 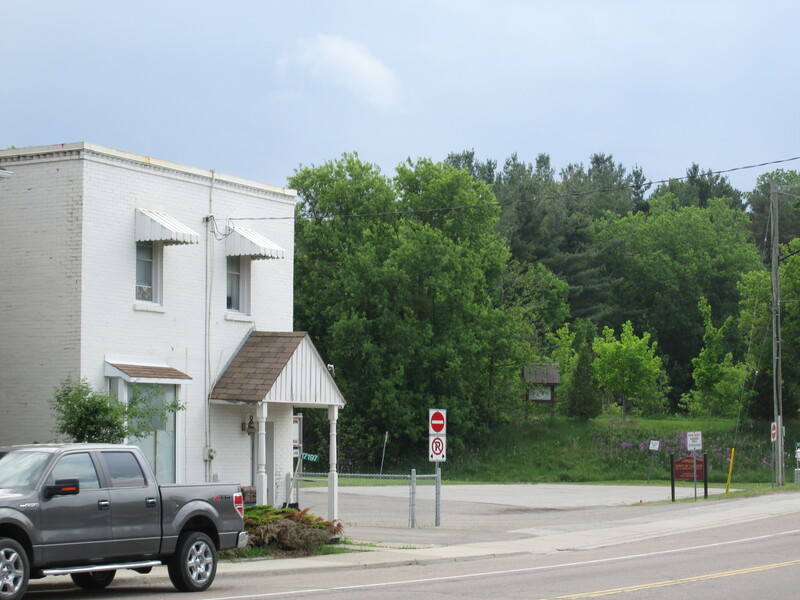 Palgrave grew up around a saw mill and a grist mill. These two industries were essential to the development of a community. 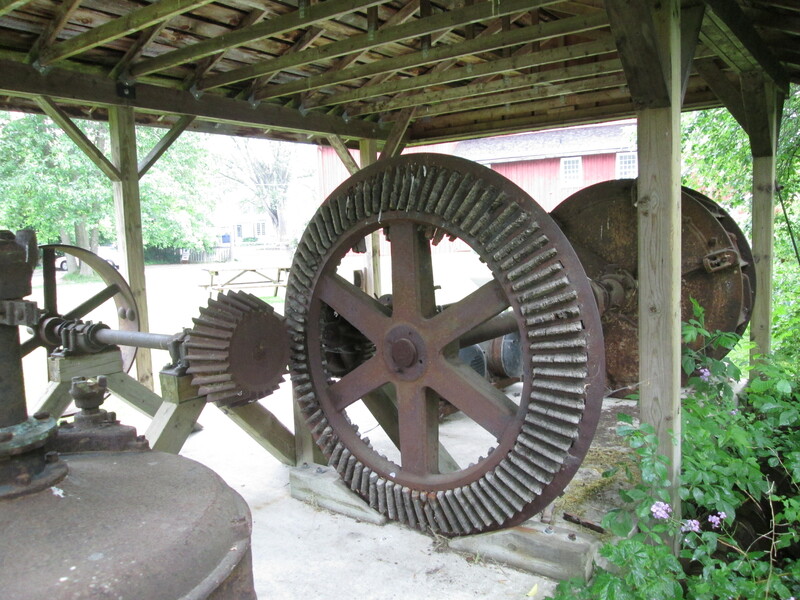 The saw mill provided basic building materials while the grist mill provided basic food supplies for humans and livestock. A dam would be built to create a constant supply of water. The mills are gone but the mill pond remains, complete with its own secrets. 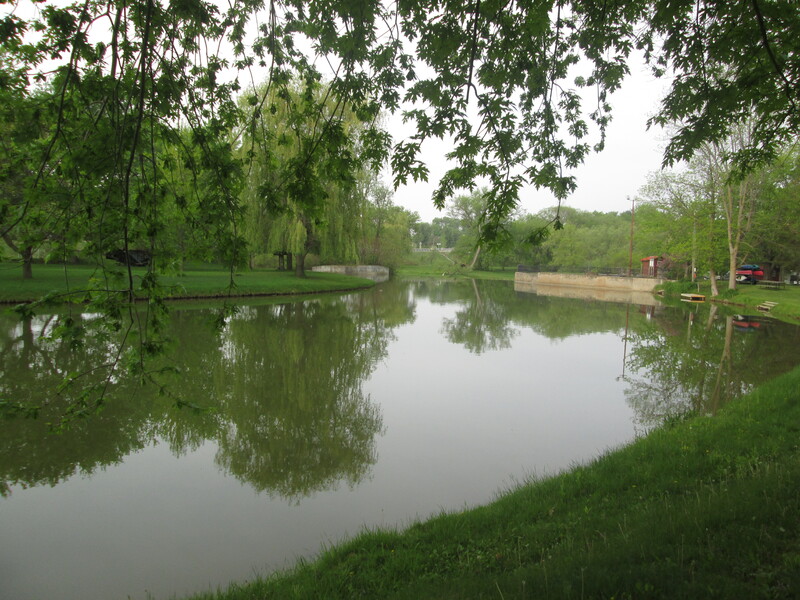 In August 2011 a body was found in the pond which belonged to a 42 year old woman who had been kidnapped from her home in Brampton. Raqual Junio was murdered by her estranged husband and her body dumped in the old mill pond. The view of the dam from below the waterfalls. 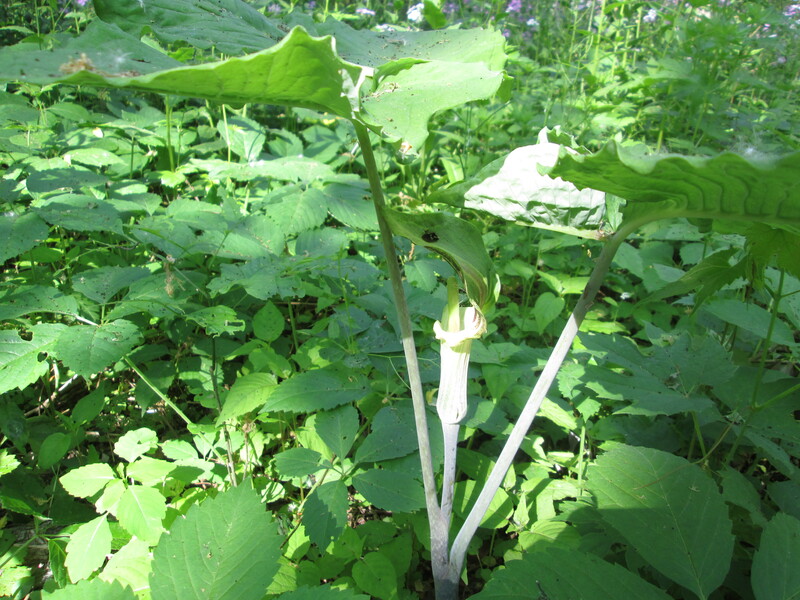 The jack-in-the-pulpit plant exhibits a wide variance in size with this example being near the upper end of 65 cm (26 inches). Identifiable by it’s flowers contained in a spadix and the hood drooped over top this was the only specimen in the immediate neighbourhood. Once cooked or properly dried this plant can be eaten as a root vegetable. The raw plant, however, contains raphides that are like tiny little needles that cause a burning sensation and possible severe irritation if eaten. The plant grows from the same corm for up to 100 years. On March 5, 1880 town lot 4 was sold to the Reverend W.F. Swallow for $70 for use as a church property. It had been the site of a store and saloon prior to that. In 1882 they purchased lot 3 beside it for use as a cemetery. Prior to this, Anglicans had to take their loved ones to Bolton for burial. 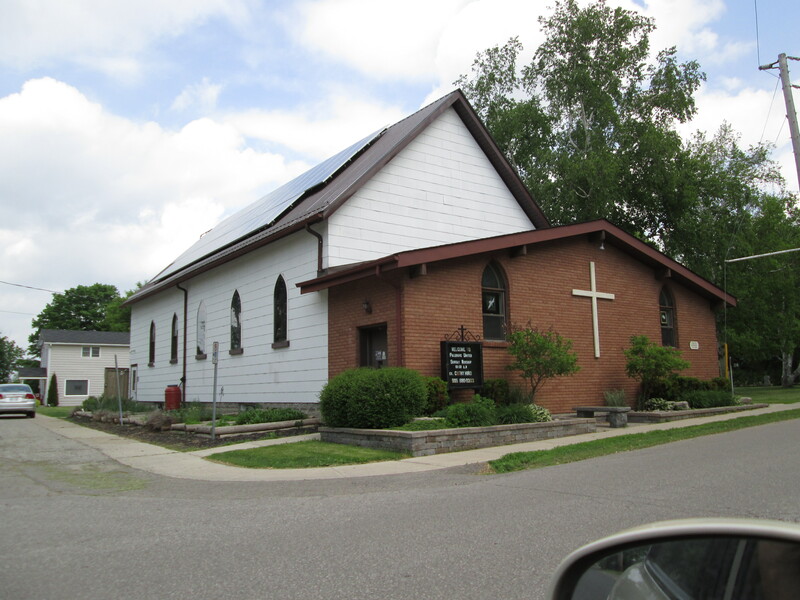 St. Alban’s Anglican Church was built in 1882 in the English Gothic Revival style that was popular at the time. St. Alban’s retains it’s original bell tower and entrance vestibule. The church was closed in 1996. The cemetery was closed in 2007 and the remaining bones were dis-interred and moved to Bolton for reburial. The church is now used as a saloon, as the property has come full circle. The one story building on the left has been built on the site of the former cemetery. The Elm Tree Hotel was just one of the hotels in town but survives with it’s unique three point roof. This hotel appears to have been built in 1878 after the arrival of the railway in town. This spurred growth and the town doubled in size in a year from 150 to 300 residents. Several other old buildings remain in town but there is little information available on-line about their history. The Elm Tree hotel no longer has it’s elm tree. It was cut down to allow for the widening of highway 50 through town. The picture below was taken in 1914 and borrowed from Wikipedia. 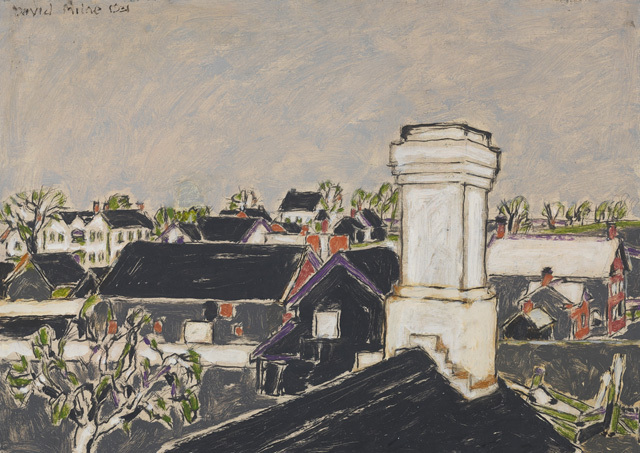 Canadian artist David Milne lived in town from 1929 until 1932 and painted several scenes. The painting Kitchen Chimney is in the National Gallery of Canada and the Elm Tree Hotel can be seen in the background at the left. His painting “The Village” is also in the National Gallery and is used as the cover photo for this post. St. Alban’s church with its bell tower can be seen at the left. In 1877 the Hamilton & North-Western railway was built through the middle of town. The railway was later taken over by the Grand Trunk Railway in 1888 and ended up as a part of the Canadian National. Passenger service ended in 1960 and the tracks were removed in 1986. The rail bed has since been turned into a hiking trail. The trail can be seen in the picture below on the little rise where the wooden trail sign stands. The Primitive Methodists built their church and cemetery in 1878 on lots 17, 18 and 19. Their cemetery remains and the church has served the United Church since it’s inception 1925. The Pan American Games are the third largest international multi-sport games in the world. Started in 1951 in Buenos Aires it now contains 41 member nations. The games are played every four years in the summer before the next Summer Olympic Games. Toronto is host to the 2015 Pan Am and Parapan Am games which run from July 10-26. 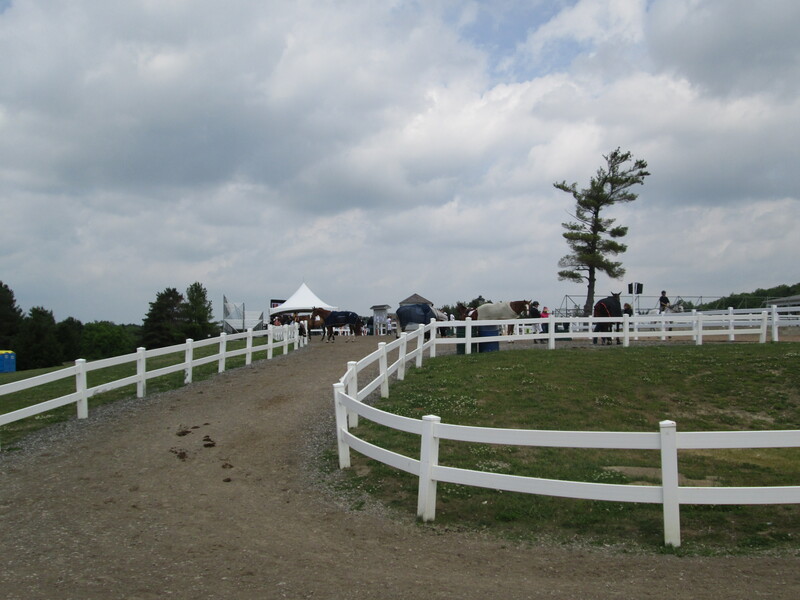 The dressage and jumping competitions will be held in Palgrave at the Caledon Equestrian Park. We were able to stop by and have a look at some of the local horses getting warmed up. 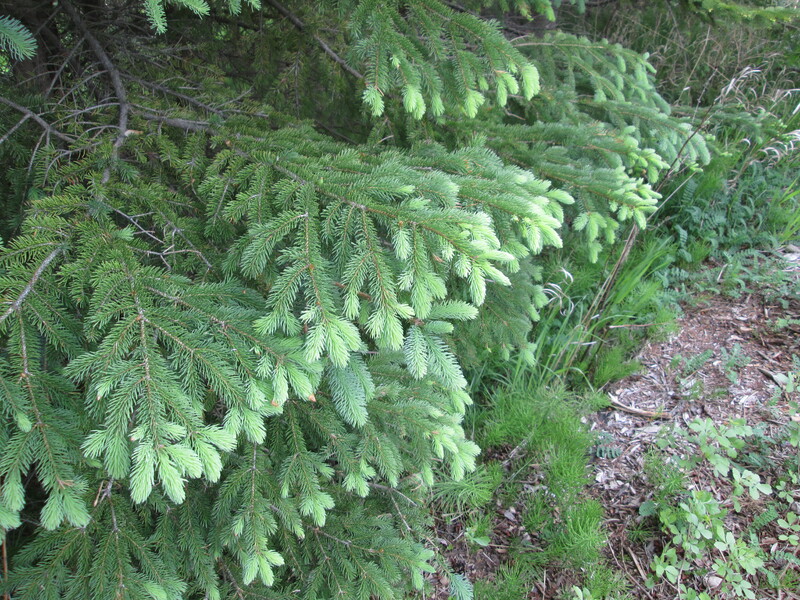 It is so nice to see the fresh green of the new growth on the ends of the pine tree branches. 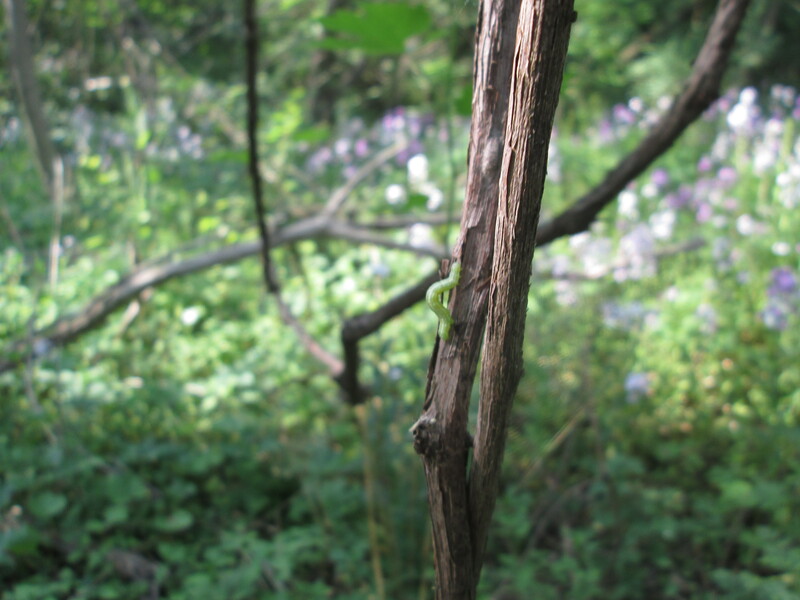 This entry was posted in Mills and tagged Elm Tree hotel, Jack in The Pulpit, Mill Pond, Palgrave, Raqual Junio on June 4, 2015 by hikingthegta. After visiting with my parents in Barrie there was an opportunity to make a short visit to a site near town. A street with the name Finlay Mill Road pretty much needs to be investigated and we were only a km away. Light rain was falling with the threat of a downpour. Willow creek crosses Finlay Mill road where a half dozen mills, a soap factory, distillery and two power generating plants once stood. 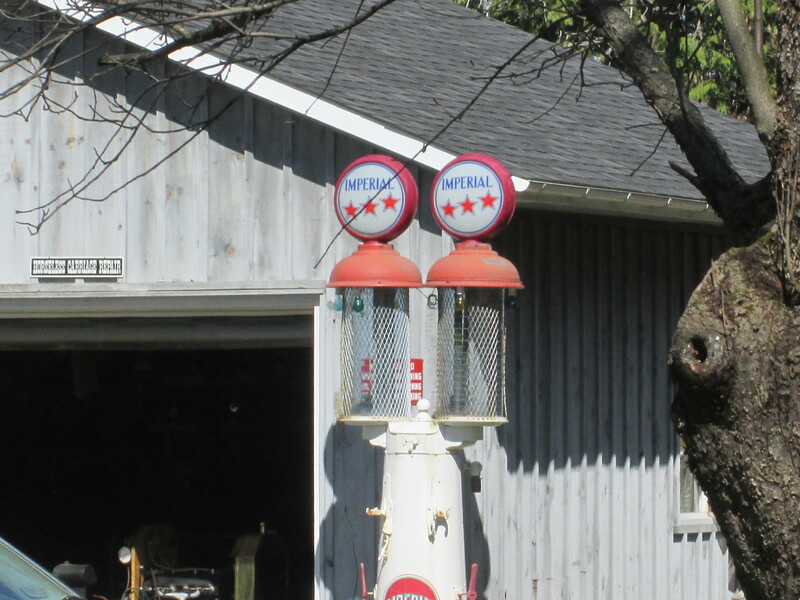 This was the industrial core of Midhurst. 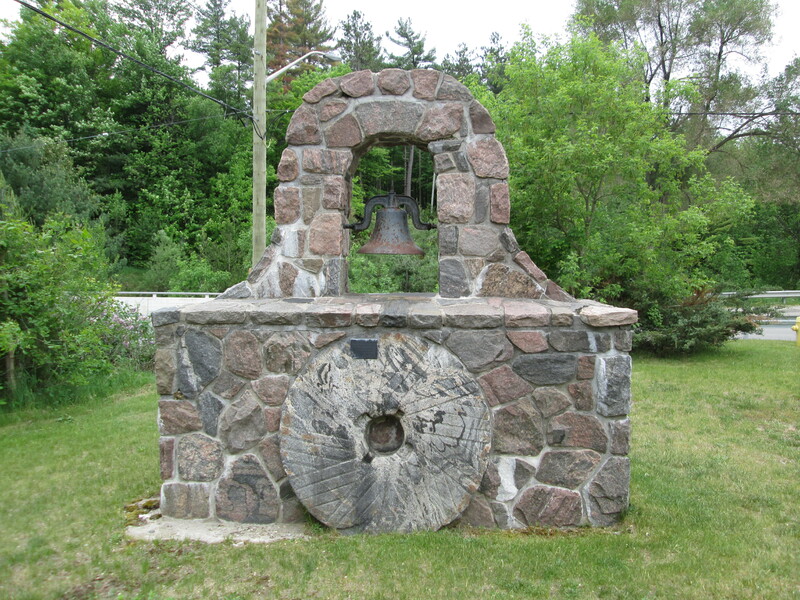 Preserved here are a set of mill stones and the school bell that was used in SS No. 6. The original building dates to 1866 but a second building containing this bell was built in 1887 where it was used until 1962. 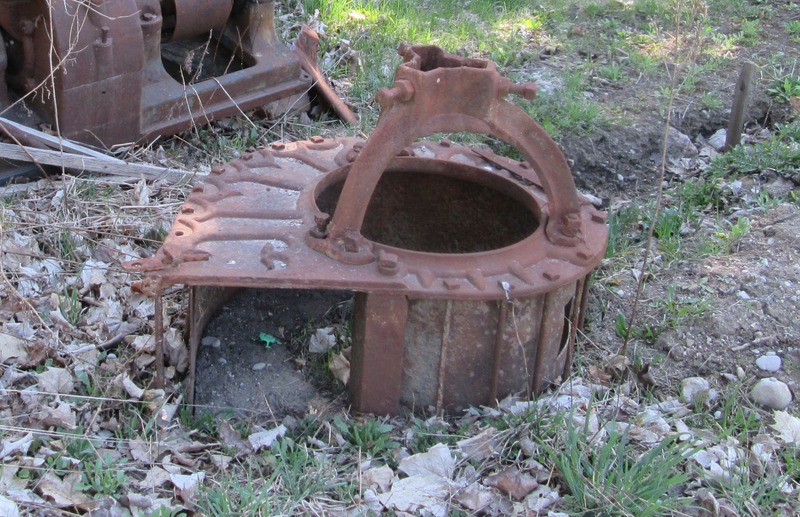 Charles Singleton Bell operated a bellfoundry in Hillsboro Ohio starting in 1875 under the name C.S. Bell. In 1882 he changed the name to C.S. Bell & Co. when his son joined the company, a name he operated under until 1894. Starting in 1894 he changed the name again, this time to The C.S. Bell Company when the company was incorporated. 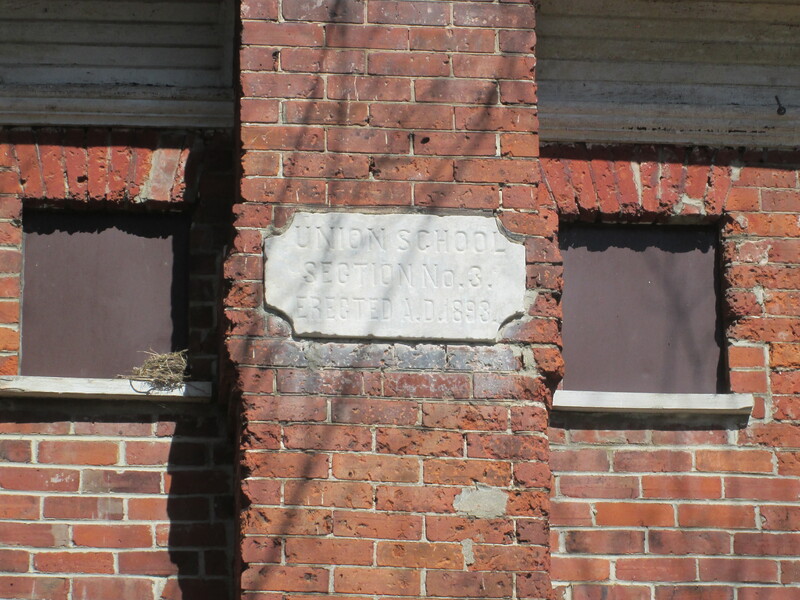 The name stamped on the bell below dates it to 1882-1894 which is correct for the 1887 date for the second school building. The number 20 on the stem identifies it as a 20″ bell. C.S. Bell and Co. sold school bells in diameters ranging from 20 to 28 inches. 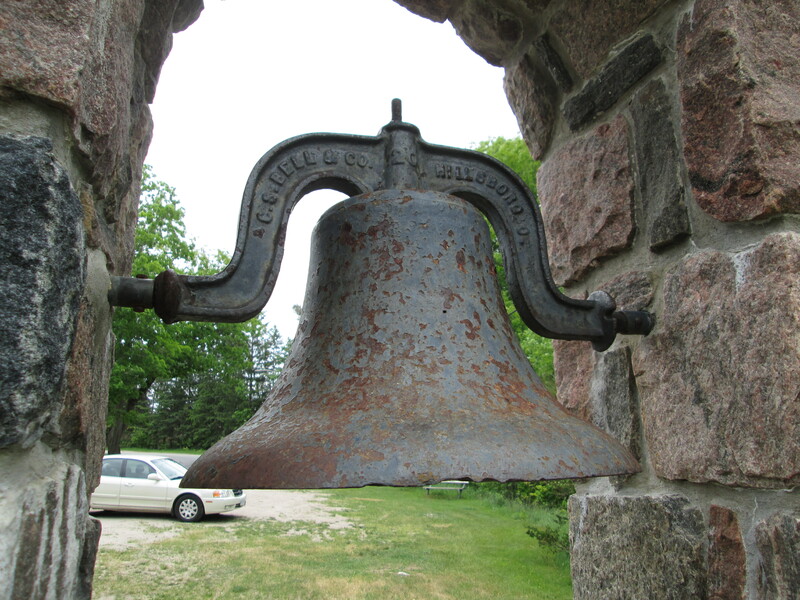 Farm bells were smaller than 20 inches while bells over 30 inches in diameter were made for churches and fire halls. On April 15, 1878 the town of Barrie enacted legislation creating the Barrie Water Company and the Barrie Gas company. Town by-law 345 in 1888 gave exclusive rights to James Burton, George Ball and Samuel Lount to provide electric power to the town. They formed the Barrie Light Company. They built two generating plants on Willow Creek. On June 4 1888 they successfully transmitted power to a station on the end of Bayfield Street. In August, with great fanfare, they lit 17 street lights in downtown Barrie. At the same time the Barrie Gas Company’s 10 year contract for street lighting expired and was never renewed. By the mid-1890’s people began to feel that the private companies were charging too much and public ownership was proposed. 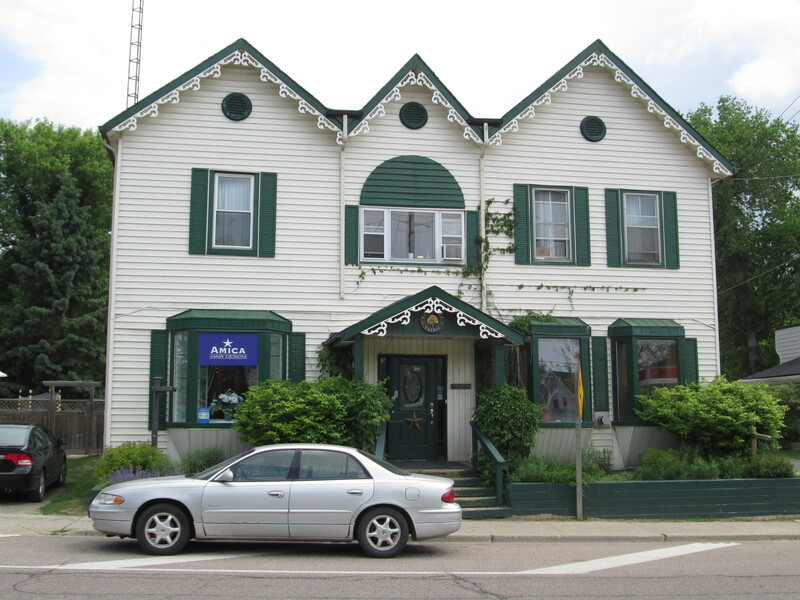 The Barrie Light Company was sold to the city for $22,501. Barrie’s population reached 6,500 by 1910 and the electrical consumption started to exceed production capacity at the two old generating stations. The solution was to switch to Ontario Hydro which was completed by 1912. The old production facility was abandoned and later demolished. 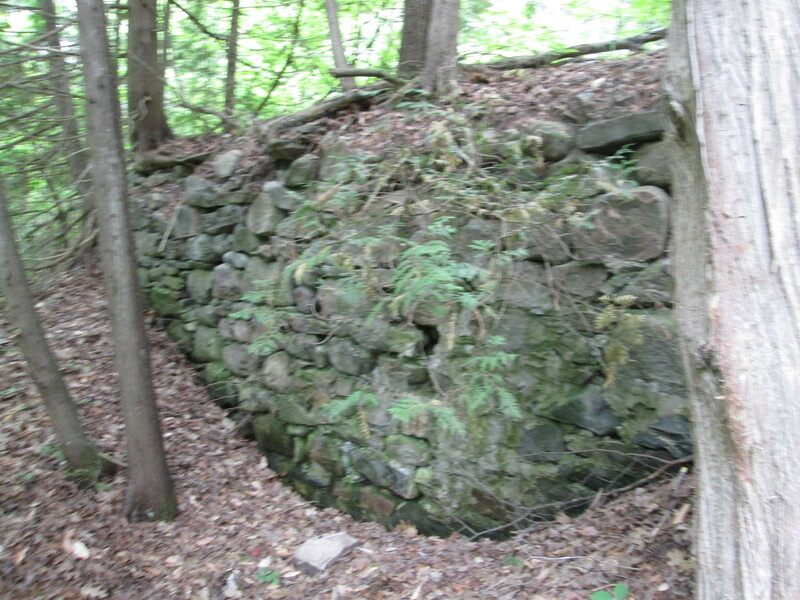 The foundations from the 1888 power generating station remain on the west side of Willow Creek. 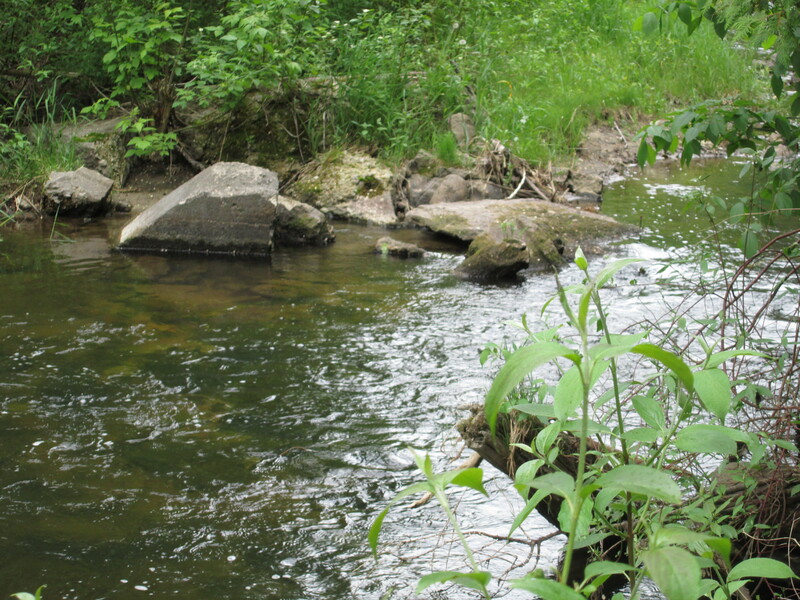 Concrete pieces are strewn across the creek where the power facility once stood. 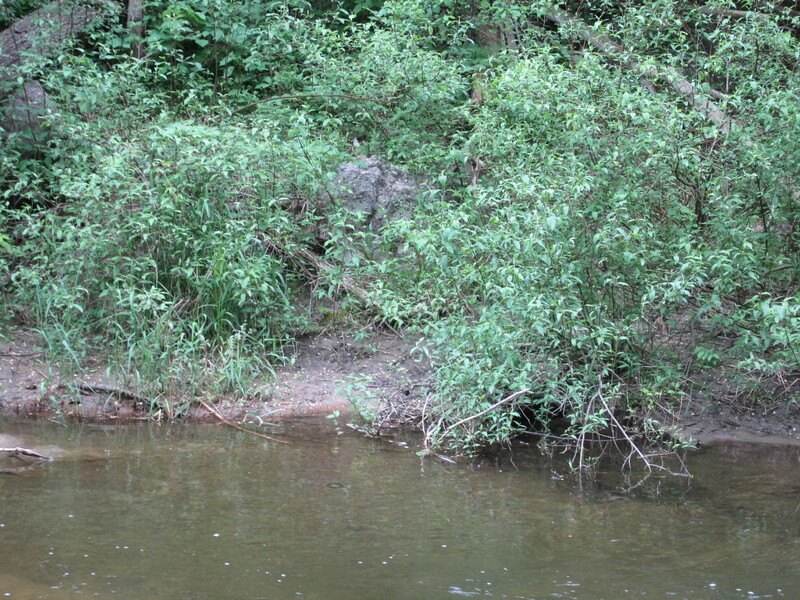 Remains of foundations can be seen in the trees on the other side of the creek. Just beyond the first power mill Willow Creek flows through an area where erosion of the sandy hillside makes following the trail a very risky concept. Dragonflies and Damselflies are two separate species which are often confused. The easiest way to tell them apart is in the rest position of the wings. Dragon flies sit with their wings spread out while damselflies sit with them folded above the back. 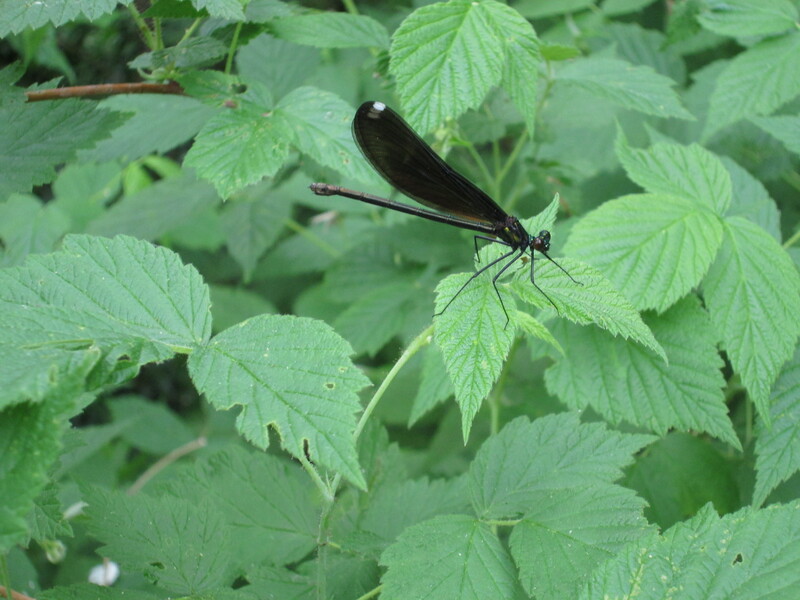 The female Ebony Jewelwing damselfly has a small white spot on the tips of the wings while the male is all black. 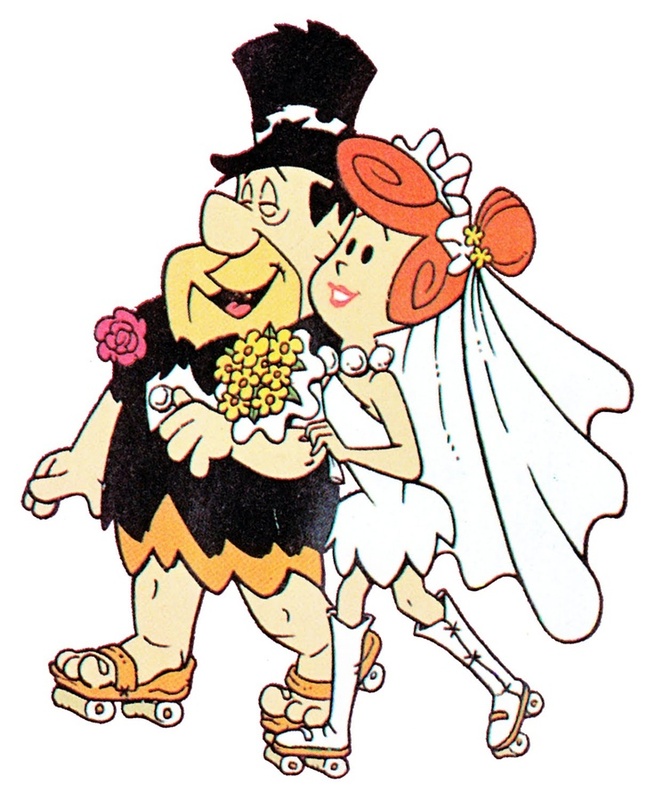 The female is pictured below. It began to rain harder and lacking a paddle we decided not to venture farther up the creek. The foundations of a second power station remain to be located on a future visit when hopefully the surrounding area will yield more of the secrets of historic Midhurst. This entry was posted in Mills and tagged Barrie Light Company, C.S. Bell, Ebony Jewelwing Damselfly, Midhurst on June 1, 2015 by hikingthegta. Victoria Day in Ontario and so I had the day off work. The weatherman was calling for rain starting later in the morning so I decided to make a quick exploration before it started. As it turns out there was no need to rush because it didn’t rain. John Nicol arrived in 1828 and built a grist mill on this site. 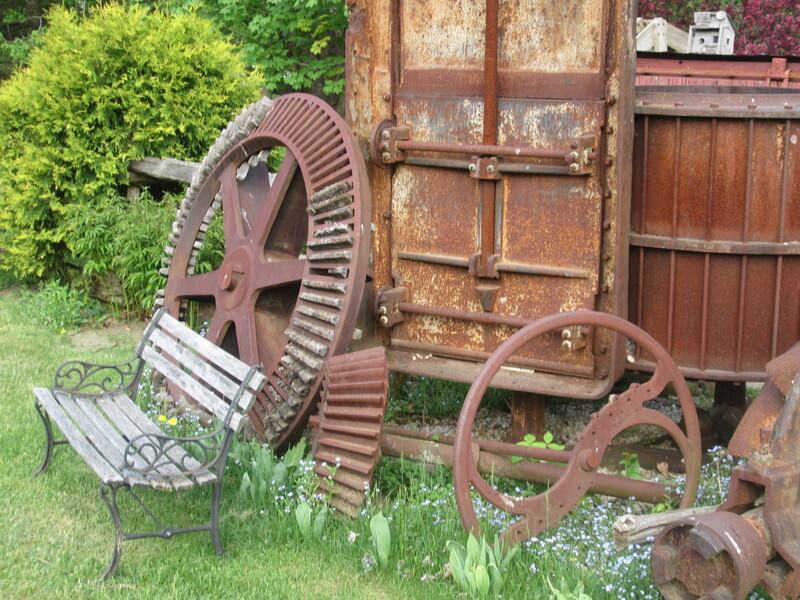 As the farming community grew around the mill it was converted to also be a feed mill. 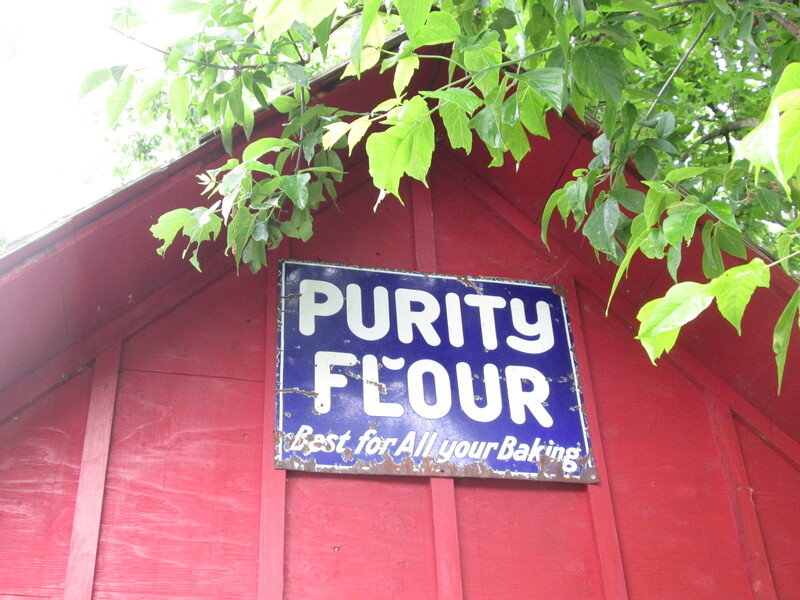 It provided flour to farmers and feed to their livestock until 1900 when it burned down. The community was without a mill until 1907 when it was replaced with this current building. The settlement came to be known as Nicolston when the post office arrived. 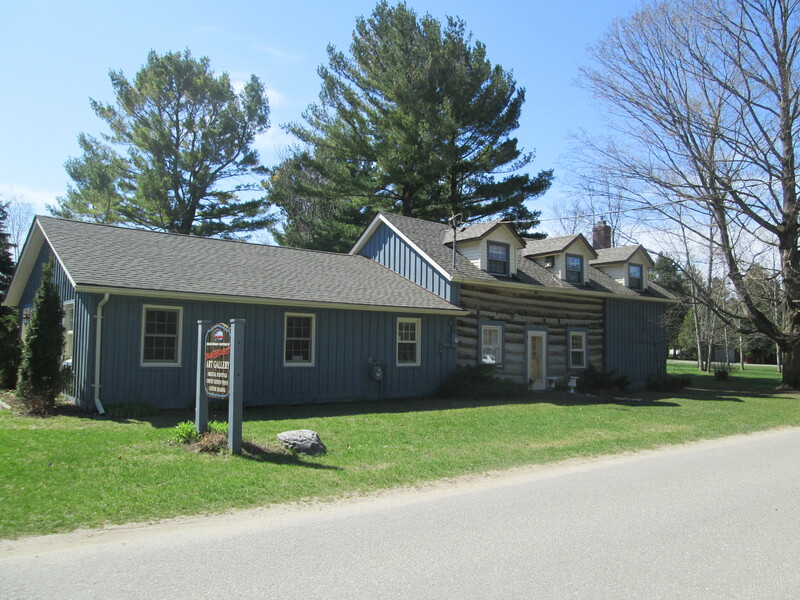 As the town grew it gained a post office, hotel, blacksmith shop, school, a woolen mill and general store. 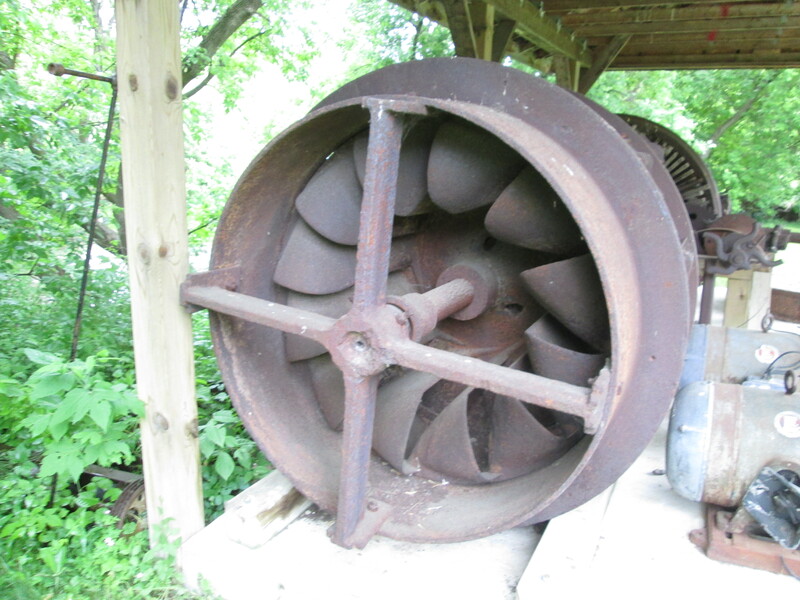 The town slowly disappeared and the mill was closed in 1967. 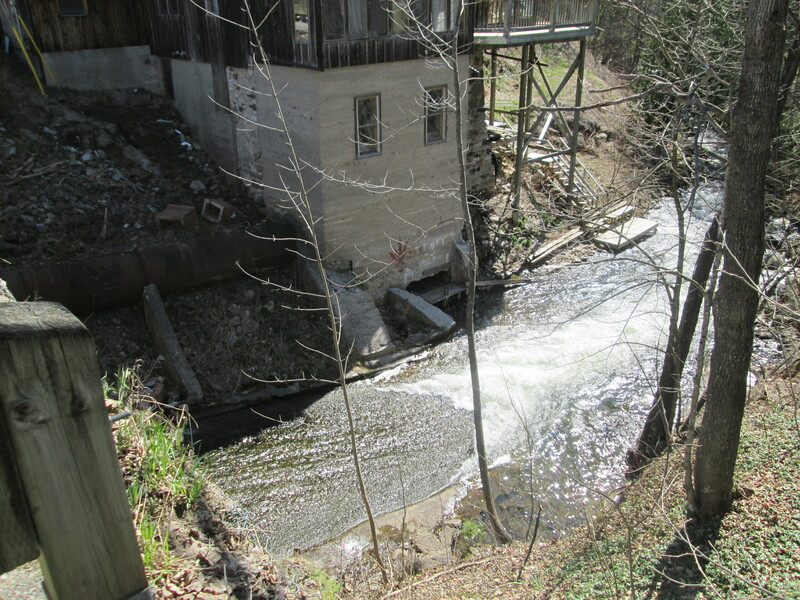 It was the last water-powered mill to close in South Simcoe. The mill area has been converted to an RV campground and it is posted as no trespassing unless you are registered as a camping guest. The river above the mill dam was quiet and is marked as no fishing. Many fish migrate between the sea or open lakes and fresh water streams and these fish are known as diadromous. 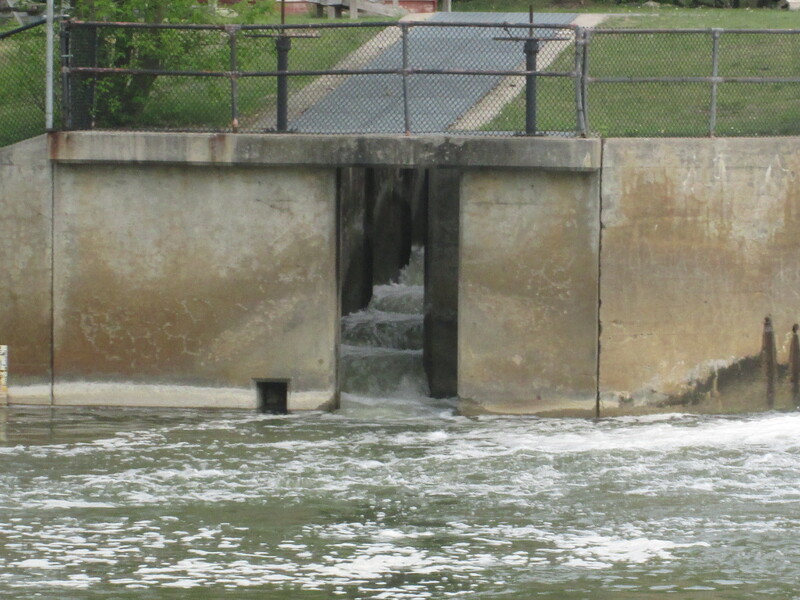 When settlers arrived and started to put dams up across the local rivers and streams they caused a major disturbance to the migration patterns of fish. 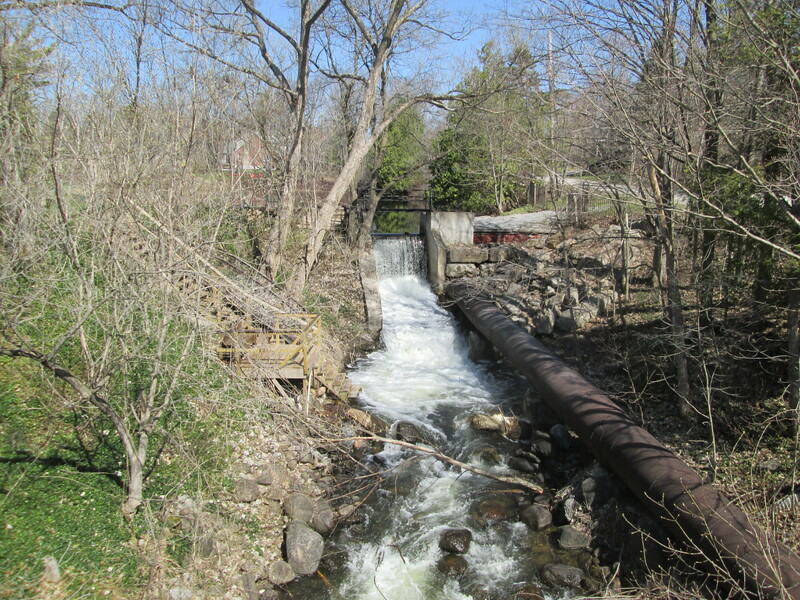 In 1837 Richard McFarlan built and patented a fish ladder to let fish get around his dam in Bathurst New Brunswick. 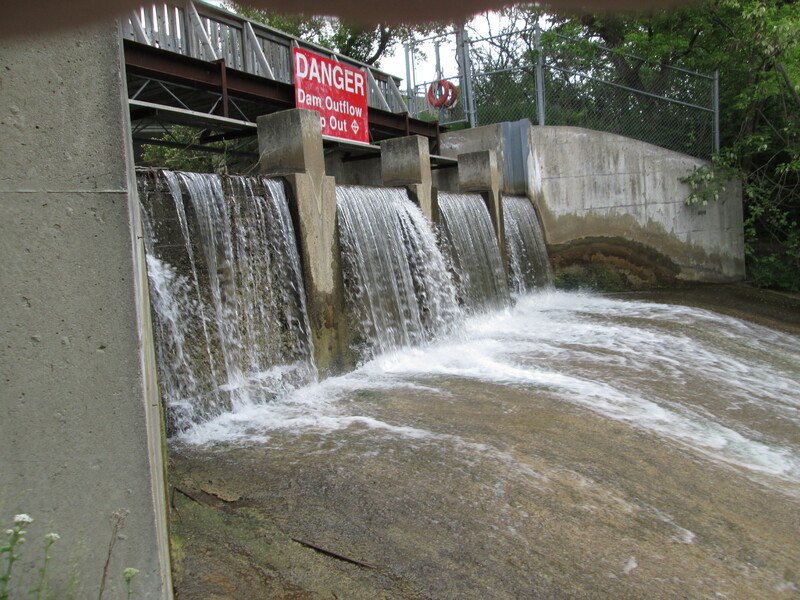 Nichols mill dam has a fish ladder as can be seen in the picture below. I wonder if maybe Darwin had seen a fish climbing a set of stairs and that inspired his theory of evolution? 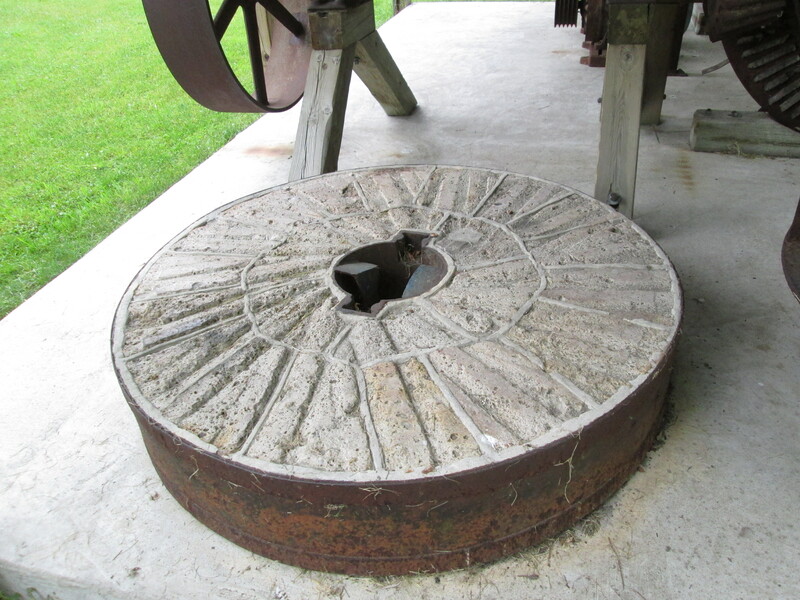 Various wheels transfered the power from the wheel or turbine to the grinding stones inside the mill. 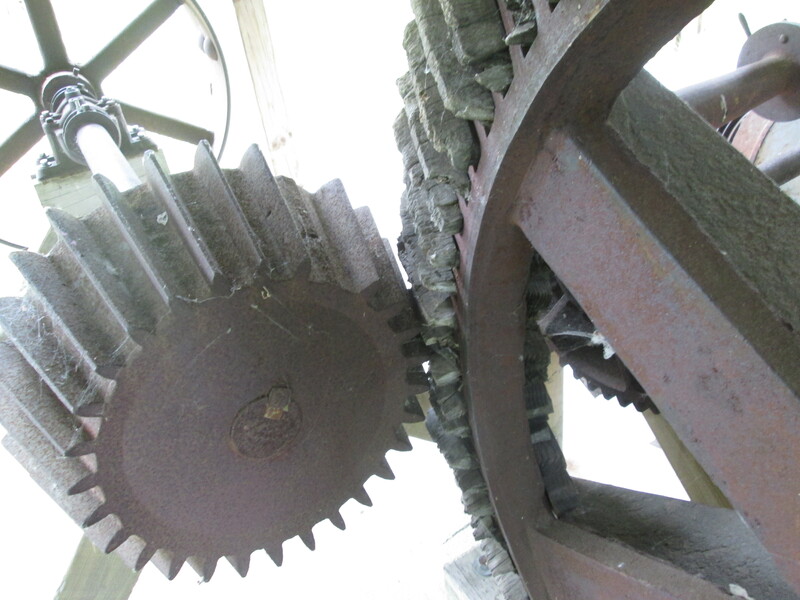 The wooden ribs are slowly falling out of the largest wheel. 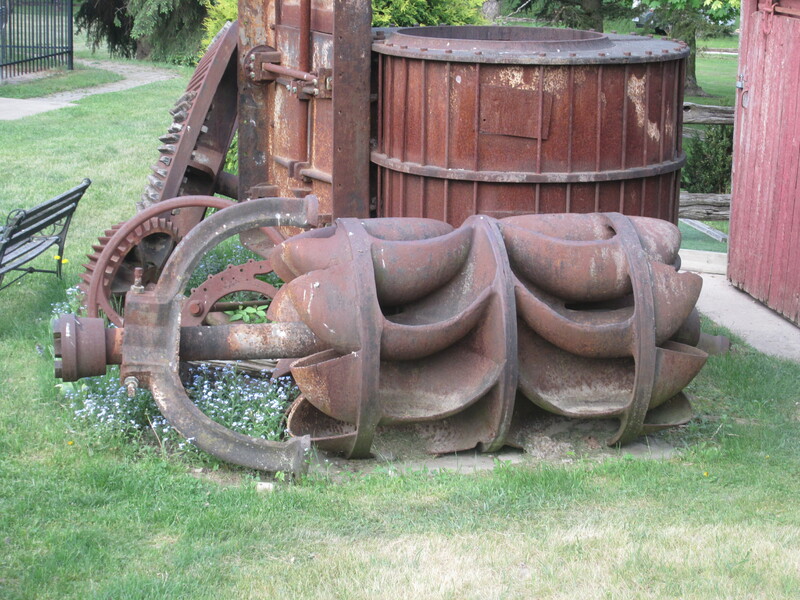 Nicolston’s Mill has a large water turbine on the side lawn. 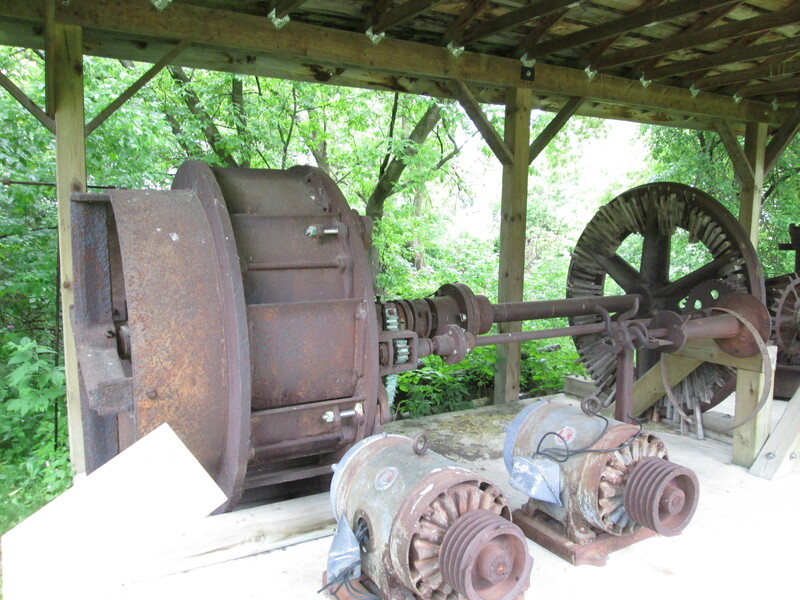 Water forced this wheel to turn and transfer energy to a series of wheels and drives like those pictured above. 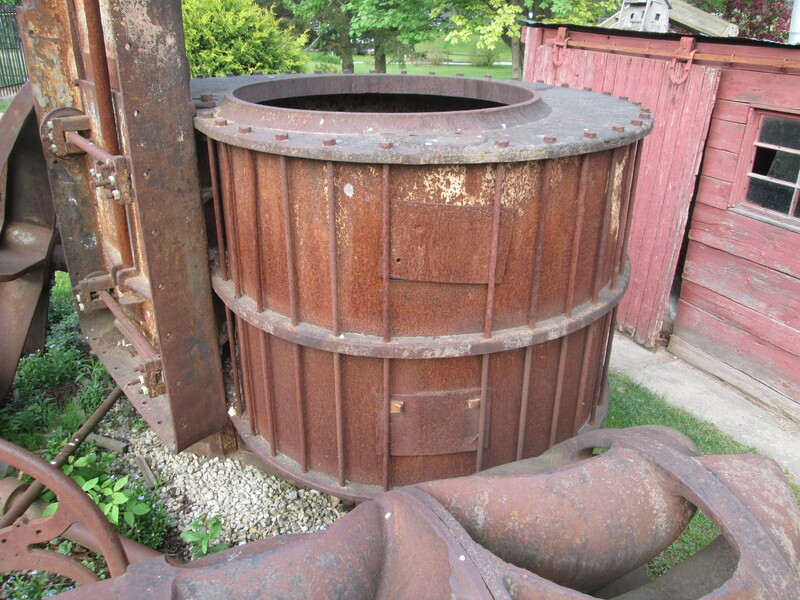 The spiral casing held the turbine blades causing them to spin by the force of the water rushing through the chamber. After visiting the mill I decided to take a drive into the countryside to see what I could see. I found an old closed road that appeared to still have an accessible road allowance. Along here I found the remnants of a shed which contained several interesting artifacts that appeared to need a good home. 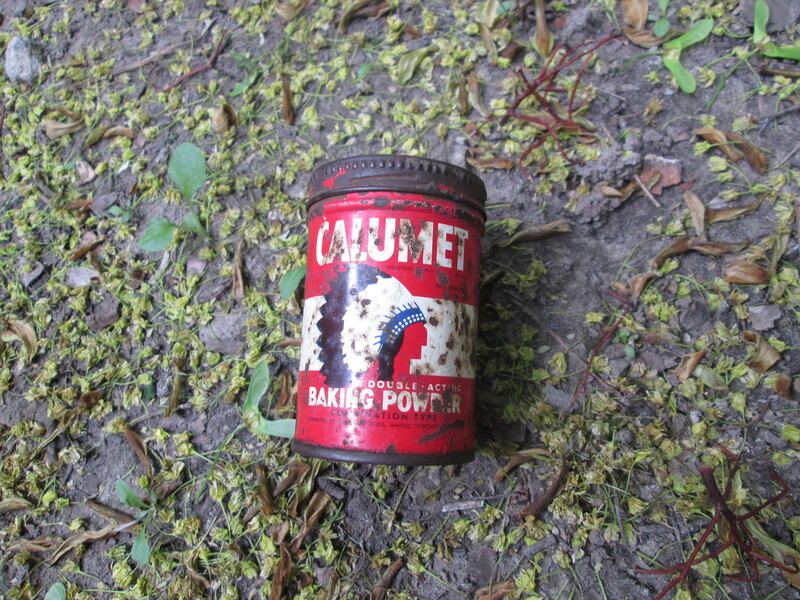 The Calumet Baking Powder Company dates to 1889 when it was established in Chicago Illinois. The company is named after a local word for peace pipe and the area of Calumet City. The company adopted an Indian Head for a logo which later appears to have been copied for the Chicago Black Hawks logo. The baking powder was known as double acting because it started to work while it was being mixed but continued working in the oven as well. In 1929 when General Foods bought them out, Calumet became a brand name for General Foods to distribute under. This little tin was a free promotional sample which was distributed by General Foods Toronto. I also found a Carruther’s Whole Milk Dairy bottle with a small chip in the lip. 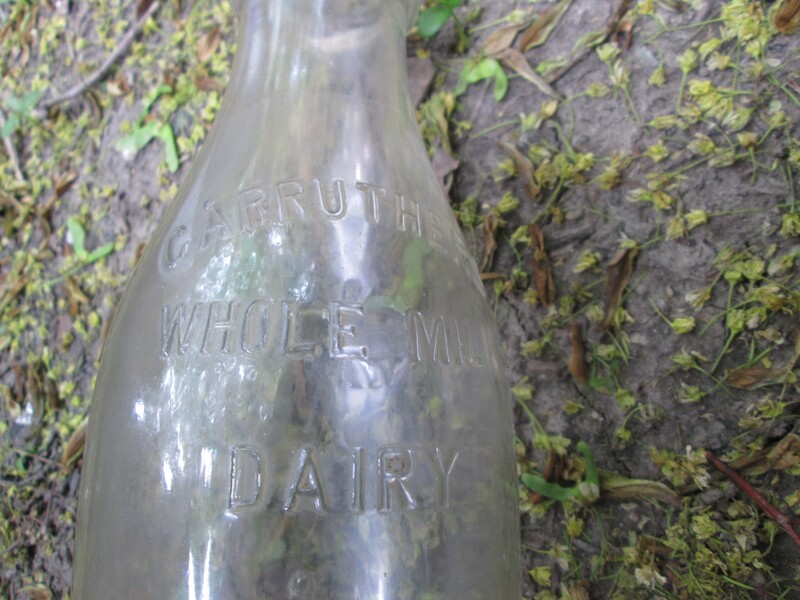 Located at 1315 Davenport Road they marketed their milk with the slogan “Carruthers’ Milk – Stands for happiness and good health, and is essential to both.” They are listed in the 1928 Department of Agriculture listing of Cheese Factories and Creameries. In May 1868 Dr. Samuel Pitcher was granted a patent for a product known as Castoria. It was sold as a laxative. In 1871 Charles Henry Fletcher bought the rights and renamed the product Fletcher’s Castoria. The bottle I found says Dr. S. Pitcher on it making it one of the first three year’s production. 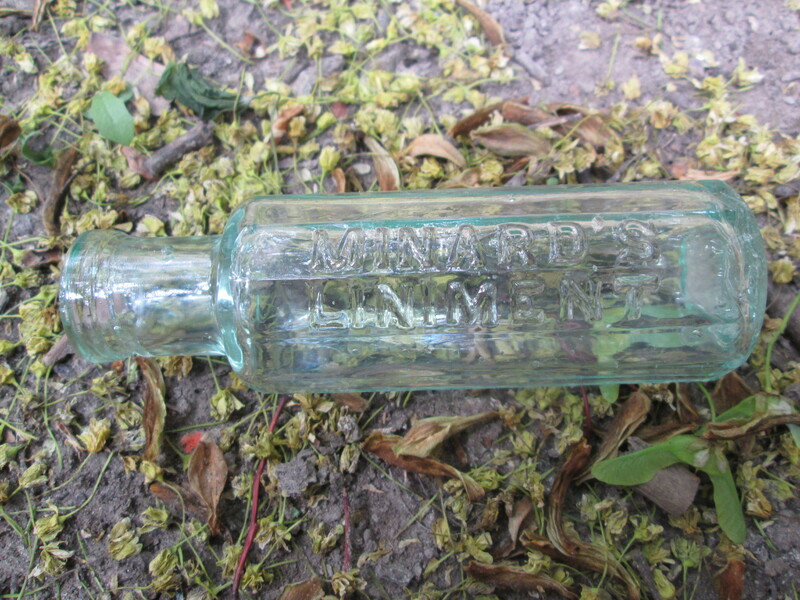 Minard’s Liniment was invented in the 1860’s by Dr. Levi Minard in Nova Scotia. Made with camphor it provided instant relief for sore muscles. 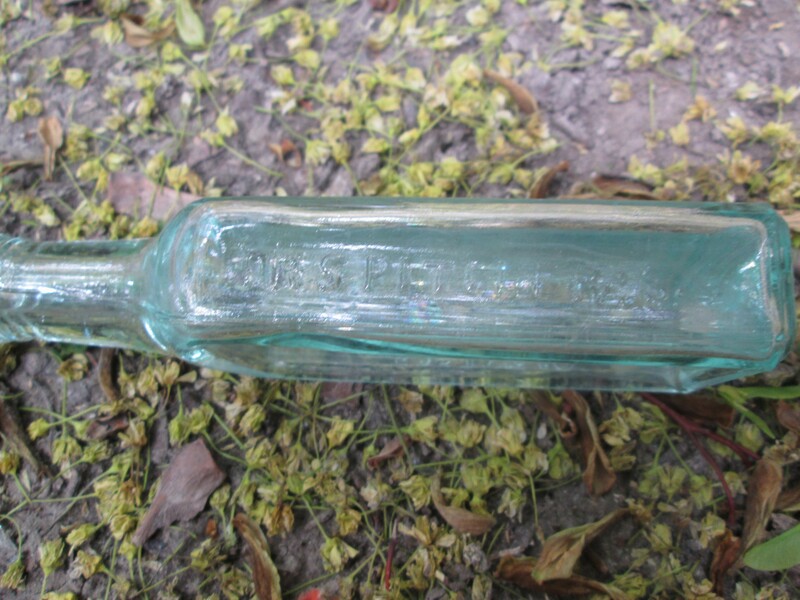 Minard’s liniment is still sold today but you have to travel to the back roads of Ontario to come up with a bottle from the 1880’s like the one pictured below. The town of Nicolston isn’t much more than a mill and a new subdivision on the hill overlooking it. 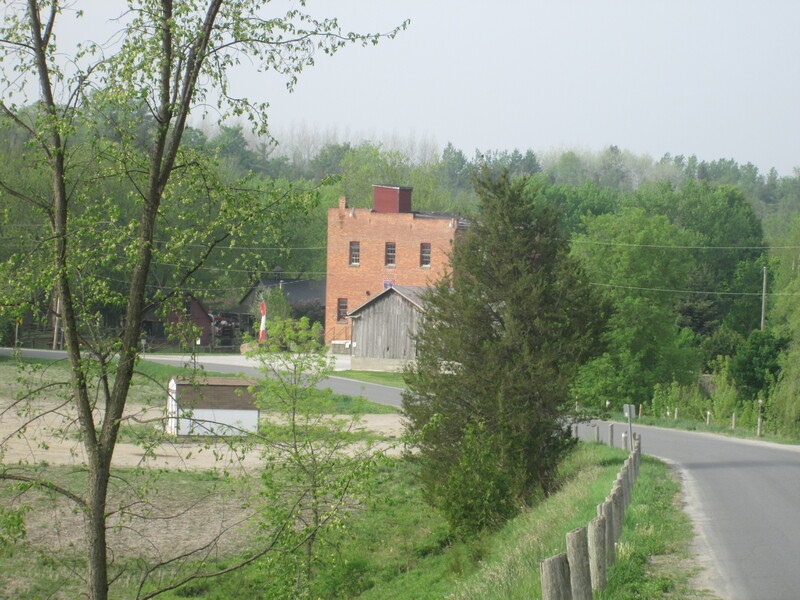 This is the view of the mill as you drive up the hill and out of town on the 5th line. This entry was posted in Mills and tagged Calumet Baking Powder, Carruthers Whole Milk Dairy, Flethcer's Castoria, Minard's Liniment, Nicolston on May 21, 2015 by hikingthegta.